Please give a warm welcome to author Christy Mckee! 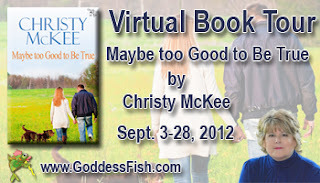 Christy, nice to have you here on the blog today! Thanks for answering all my inquiring questions. It is such a pleasure being with you today. Thank you so much for inviting me. 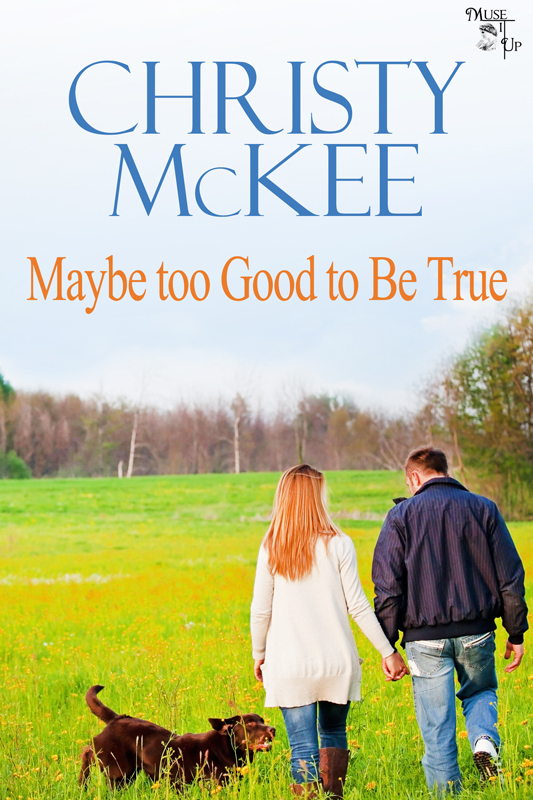 Maybe Too Good to Be True, which is a contemporary romance, is my first book. So far I’ve been sticking to contemporary romance, but I’ve just started a ghost story which means I’ll be dabbling in the paranormal. It won’t be a light paranormal, but dark and sensual. I am a converted plotter. Save the Cat is an enlightening and very useful book on plotting, which I bought for a class that I took last spring. It was an excellent Plot Like a Pro workshop with Lori Wilde and it transformed me into a plotter. It doesn’t take any of the fun or excitement out of writing the story. After all, even pirates needed a treasure map to find their gold. I write from 9am to 1:30pm, Monday through Friday. Take a break until 2pm, then work until 5:30pm when my husband comes home. Later at night, from 10pm to 12 or 1am, I catch up on email and blogs. On Saturday and Sunday if we are in town, I write four hours each day. My taste is eclectic. 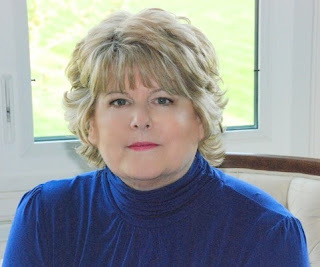 I love Susan Elizabeth Phillips for humor, Linda Lael Miller for cowboy stories, Christina Dodd for everything, Jodi Picoult for serious issues, Laura Adrian for vampires, Robyn Carr for her wonderful series, and Janet Chapman for her time travel and whimsical paranormal. What is something you'd like to accomplish in your writing career next year? In the coming year I will finish my second contemporary, Too Close for Comfort, and write my ghost story. The ability to time travel with enough precision that I could adjust my arrivals and departures to a specific calendar day, year, and location. Ooh, what a fun question. I would pick a magical winged horse. Of course it would be all white and shimmery like vampire Edward Cullen’s skin in daylight. 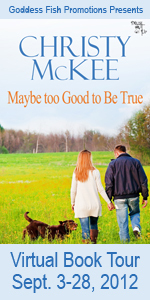 Gabrielle March receives a windfall that completely changes her life. It is not a Cinderella or rags to riches tale, although that’s part of it, but a story about a talented woman in the enviable position of suddenly having the means to make her biggest dream come true and being too filled with self-doubt and guilt to embrace it. She’s met the perfect man for her, but fears she will never fit in his high powered, sophisticated world. If she can’t pull herself together, she runs the risk of losing it all. Since you asked for “something,” I would have to say my computer. Maybe one day but not now. Queen Elizabeth I. Since I have the ability to travel in time, I would ask her if she would like to visit the future. I hope that since we are related through the Boleyn family, she will agree to accompany me to present day so that Elizabeth I could witness the reigning queen’s jubilee. Travel is my favorite. Whether it’s going across the continent or a few hours out of town, I’m always up for a trip. Photography is something my husband and I enjoy together. We are dog lovers and have two big Labs, Lambeau—named after the Green Bay Packers’ Lambeau Field—and Gracie, who is just plain Amazing Grace. Maybe Too Good to Be True. I wish I could paint. Sadly, I can barely draw a straight line. Comfy chair on our shady deck. Beef Wellington, glazed baby carrots, potatoes and for dessert, chocolate mousse. I would take an around the world cruise for one hundred and forty days on a five star rated ship. Of course we would have the penthouse cabin and veranda cabins for all of our family members and friends who wished to go. Gabrielle March is summoned to an oceanfront estate in Massachusetts by the matriarch of Atlantic-Hastings International where she is presented with a hefty block of shares as amends for a crime committed against her family. The stock—worth several million dollars—can give her the means to make her dream come true if only she can muster the courage to break free from her past and believe in her unique creative talent. Pierce Hastings, son of Gabrielle’s benefactress, grudgingly agrees to take her under his wing and acclimate her to Atlantic-Hastings. Never one to mix business with pleasure, Pierce stuns himself when he ignores his own self imposed rule. Gabrielle’s complete lack of artifice, unvarnished honesty and quirky sense of humor are intoxicating to him―and he’s rapidly becoming addicted. He’s blindsided when Gabrielle confesses that, in spite of her growing feelings for him, she will never fit into his world of power and privilege and has no desire to try. "Nobly put, Miss March.” The woman certainly didn’t pull any punches. Sarcasm, even with a lovely Southern accent, was still sarcasm. "I see.” Pierce sounded duly impressed. “That’s certainly an accomplishment for such a young …” He froze when her eyes narrowed. What the hell was wrong with him? He careened from one blunder to the next. "Tell me, is it my age or the fact that I’m a woman that bothers you?” Her face was considerably more colorful than the rest of her and he knew it had nothing to do with the heat. Pierce was no chauvinist and certainly had no prejudice against successful females. After all, he’d been married to a talented trial attorney. Hadn’t he put his wife through law school? Hadn’t he supported Glenna in every way until she made partner in her firm and then announced that she’d changed her mind about having children and, by the way, she didn’t want to be his wife anymore either. "I didn't mean that you weren't responsible.” His eyes returned to the very entertaining Miss March who had just snapped up the ball and was ready to run with it. Where did the woman get her information? She’d obviously pegged him as some sort of wealthy derelict. Fired up, she was something. Misinformed maybe, but she had balls of steel. "For a newspaper woman, you’re lacking in your facts, Miss...."
My addiction to reading emerged when I was ten and down with measles. My mother, trying to keep me entertained, brought home a stack of Trixie Belden and Nancy Drew books. Within days, I’d consumed them all and asked for more. That’s when it truly began−the pleasure of reading which would eventually lead to my writing. I can’t pin point precisely when I knew I was different from everyone else−at least from my tight group of hometown friends. Didn’t everyone have movies playing in their heads starring beautiful characters leading adventurous lives in exotic places? NO—they did not. Did that mean they were normal and I was the odd, slightly wacky duck? My answer to that conundrum came when I attended my first writer’s conference in Savannah. Nervous about being on my own at the crowded event, a kindly writer from Texas took me under her wing and introduced me to at least a dozen writers. Surrounded by so many writers who were so like me, I fit right in. I wasn’t an “odd” duck after all; I’d simply been in the wrong pond! As a result of that conference, my desire and conviction to write blossomed. Still working a full time job at a Louisiana cancer center, I carved out time to write every night and on weekends. My first manuscript went through four incarnations, and a year under the bed, before success came knocking. Today my family and our two Labs—Lambeau, the Green Bay Packers unofficial mascot and Gracie, who is just plain, sweet Amazing Grace—live in a picturesque little town in Ohio wrapped around a lovely town square with an intricately carved gazebo where weekly band concerts take place all summer long. Thank you for hosting Christy today. I look forward to reading this book & the next. Paranormal should be dark & sensual. You are right. A paranormal has to be dark and sensual! Thank you so much for following along with me on the tour. Great post, I enjoyed learning more about you. by and commenting. It's nice to know there are people "out there" reading our interviews. Your name goes into today's drawing. Maybe you'll be the winner of a free e-copy. Thanks for the fun and informative interview. Can't wait to read this book. Do the people at your day job know you write? Thanks for coming by and commenting. Thankfully, I write full time now so I don't have to compete with an outside job, but I did for several years. There are not enough hours in the day. I am really enjoying following your tour. Each time I learn a little more about you and about your book. This book sounds wonderful, especially since it is your first book. Please keep on writing. Maybe first books are like first loves, you never forget them. Thank you so much for following along with me on my "first" book tour. I'm working on the next one now. I've been enjoying the tour--congratulations on the release!